This luscious shade of orangey-pink will be everywhere this summer. Brides can take it in almost any direction they please – from pretty boho, to tropical sunset, to urban cool. It’s a colour that pops just as much against paler sage greens as it does against deep, glossy monstera leaves – which gives us plenty of scope to design wedding flowers with real impact. Peonies, ranunculus, roses, anemones and parrot tulips are all likely to feature strongly, along with more unusual varieties like proteas. For those that like their colours a little more subtle, nature is a big influence. Continuing the ‘loose and wild’ feel of the last couple of years, brides often ask us for bouquets that are a little less contrived – as if they had wandered through a meadow and gathered the stems themselves. This year, we’ll use pampas grass for texture and structure, alongside duskier pinks and even beige tones; or we’ll keep shapes interesting with longer, slimmer fronds of greenery and trailing ribbon. Huge, circular tables – where the person opposite is too far away to chat – are increasingly off the wedding breakfast menu. Long banquet tables are bang on trend, with scope for detailed floral runners or smaller, low level arrangements repeated down the length of the space. For couples on a budget, this is a really easy look to achieve – simple strands of ivy or eucalyptus, wound between glass votives, are just as pretty as an expensive garland. It’s not only businesses that are cutting down on the plastic. 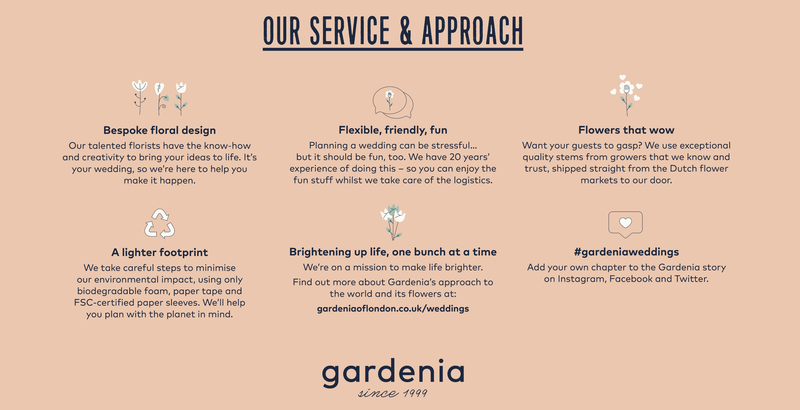 The couples we meet are increasingly interested in Gardenia’s eco-credentials and often ask us to create wedding flowers with low environmental impact. We only use biodegradable floral foam and paper tape in our arrangements, and our florists have a wealth of suggestions for displays that use recycled or reusable containers. Milk bottles, tin cans and jam jars have long been favourites, but this year we’re adding gin bottles to that list – there are some really beautiful ones around. Are you planning a wedding this year or next? You can book an appointment for a free, no-strings consultation with a Gardenia wedding flowers specialist here, or find inspiration for your own big day on our Pinterest boards.